The funniest part of my job is the variety of donations, and the strangest I thought was a squeaky giraffe dog toy. We had received about five of them, which all sadly ended up in the bin before I realised they are actually quite expensive baby teethers. As the toy has a small opening, we didn’t feel we could safely clean it to be sold. Then just as Sophie (number six) was about to go on the journey to landfill, a lovely lady walked in and asked for squeaky baby toys for her dog. Since then ‘Squeaky Lady’ has been in several times and we hear all about Sophie and how her dog gently carries her around the house. I am so happy that Sophie has now found a home to be loved again. Time is flying so fast at All4kids2 and every day I am amazed at the generosity of people with their amazing donations, and how so many people who are willing to give their time to support our charity. We really have the best group of volunteers who are more like one huge family, without them, none of it would be possible. I am also getting to meet lots of people who have been through similar battles with the education system. Most have either had struggles at school themselves, have children who are struggling or know someone else who has. I feel so privileged to be part of making the SOS!SEN Walk-in Advice Centre possible. It is held in the back of the All4kids2 shop (117 High Street, New Malden, KT3 4BP) on the first Wednesday of every month (excluding school holidays) from 5-7pm. Every day I am grateful to be part of SOS!SEN, such an amazing charity, helping to empower parents with the knowledge, so children with Special Educational Needs get the right help that they are entitled to. Thank you so much for following my blog. Please share, so we can help raise awareness and much needed funds, so we can provide this support to families who really need us. I am so excited to announce that SOSSEN are coming to New Malden. We are having an ‘Open Meeting’ on 23rd September. Please come along and meet the Advisers. 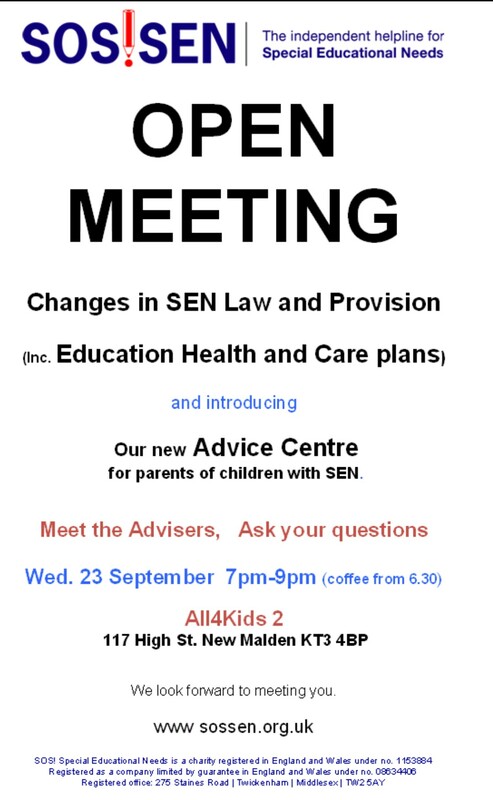 Ask your questions about SEN Law and Educational difficulties your child may be having. We will also be looking for feedback on the type of advice service needed in New Malden. Have a look at http://www.sossen.org.uk to see the types of services we provide. It is September 2013, and Year 8 has now begun. Everything is taking so long that I wrote to the Head of the Education Department at the Local Authority (LA). I had been advised that I didn’t need to put any details in the letter just the fact that Josie was on School Action Plus and that I am asking them to carry out a Statutory Assessment as she is falling behind even with a high level of support over seven years. I showed the letter to Josie’s school SENCo and I was told to add that the school supported my application. The LA wrote back to me asking me to complete a Parental Questionnaire giving as much detail as possible and they wrote to the school too for their records. Once they had looked at the information we had sent, they wrote to myself and the school to say yes they would carry out a Statutory Assessment to see if Josie needs a Statement of Specisl Educational Needs. I was now asked if I had any more evidence that I wanted to add to the case, and they collected reports from all the professionals that had been involved with Josie, including the Educational Psychologist whom she had just seen. All of this information was to be submitted by January 2014. Waiting again, I was so nervous. But all the professionals seemed sure that Josie needed a Statement, her needs were clear and very obvious. It was even mentioned that the process should be quite quick as it was obvious that she needed support. But in February 2014 I received a ‘Note in Lieu’. This is a letter that details all the support she needs and confirmed that she would need Speech and Language Therapy (SaLT). But this a Note in Lieu (NIL) is not legally binding. The support doesn’t legally have to be provided, and there is no extra funding to provide the support. I arranged a meeting with the Caseworker from the LA and Josie’s SENCo at school. We talked about all of Josie’s needs. I don’t feel confident in meetings that I can get all my points across, so I typed up a list of all the main facts I felt the LA needed to know, and instead of reading from the list, I gave them copies to work through during the meeting and then keep for their records. They suggested several ways the school could try to provide the support. But none of the suggestions were possible, also SaLT is not funded at Secondary level without a Statement. They agreed that Josie’s needs now seemed greater than they realised from the reports that they have, and they said that they would send this additional information back to the Panel to review at their next meeting. Then in March 2014, I found out that they have issued another Note in Lieu. This one is more detailed and it also says they are sending someone into the school to suggest ways they can help Josie. Totally unbelievable, how can they not give her the help that the Educational Psychologist, Dyslexia Specialist and Speech and Language Therapist all agree she needs. As soon as Josie started Secondary School, I contacted the Special Educational Needs Coordinator (SENCo) at school. I explained my worries and asked if she could be tested for Dyslexia. In the beginning of October 2012 a Dyslexia Screening (a short 15 minute test) was carried out which showed up ‘traits of dyslexia’. All that it recommended was that she should be assessed again before sitting her GCSEs, to see if extra time would be allowed for exams. I couldn’t see how extra time in her exams would help when I felt it was so obvious that she needed more support now. The school put extra classes in place, so for an hour a day (four days a week) my daughter attended a Fresh Start Reading and Writing group during school time, and also small maths groups. This was to help her catch up, but meant she would miss out on other vital lessons. I needed to make sure she was getting the right help and to find out about dyslexia, and a web search turned up endless websites (look at my Links page, for the ones I found most useful). I couldn’t find anything local and really felt out of my depth. I telephoned the BDA helpline about the same time, with no idea what questions to ask, I knew nothing, but knew I needed help. From what I can remember it was suggested that I look on the BDA website to find my Local Dyslexia Association. My closet one was 15 miles away in Croydon, so I decided not to go. I then continued my web search finding Dyslexia Action, Helen Arknell, etc etc and felt increasingly more lost. I phoned Dyslexia Action, and because I didn’t know what I needed to ask, I just found out about tuition, which was out of my financial reach, so I kept on searching. I have started my blog now because I felt so lost at this point. I had no one to hold my hand. How could someone give me answers when I didn’t understand the questions? One day I accidentally spotted the British Dyslexia Association ‘Empowering Parents’ free workshop, in March 2013 (Waterloo). I booked a place and then nervously went along and listened to speakers talk about Special Educational Needs, Code of Practice, Statements, EHCPs, MindMaps, and endless other things that I had never heard before. But the main thing I realised is that I need to understand my daughters strengths and weaknesses, which I would get in a Full Dyslexia Assessment. Also that I would have to pay for this myself (between £300 – £600). It was mentioned that my nearest place to contact would be Dyslexia Action. I also found out that there was a meeting at Croydon Dyslexia Association a couple of days later, and that I might find that of interest, and it isn’t a million miles from where I live. I went along to the Croydon meeting armed with the Screening Test results and samples of Josie’s work. I met some lovely people, and was given the name Sarah Beard (at Dittas) as she carries out Dyslexia Assessments. I was told that she would be the best person to talk to. I telephoned Sarah, and said I think I need a Full Dyslexia Assessment carried out as I was concerned that my daughter might be dyslexic, and I want to understand her strengths and weaknesses, so myself and her school can understand how best to help her. After I completed a questionnaire, sent more samples of Josie’s work, and copies of all Speech and Language reports. I had another chat with Sarah and she discussed the implications of the Assessment. How would we handle the situation if it shows no signs of dyslexia, if the problems are caused by a low IQ, or other issues. I said I just needed to understand what the issues were, and then find out how to support my daughter. April 2013 Dyslexia Assessment day… My daughter enjoyed the assessment as Sarah really is a wonderful lady. When we went back to collect her, she said almost straight away, that yes she has dyslexia. Now we have to wait for the report for all the details. I would like to share my story for others to learn from. To help empower other parents in the fight for the right education for our children. My fourth child always struggled with spelling tests. She would get so upset when we tried to learn the words at home. Unlike her older brothers, she just couldn’t seem to learn them. At the time I thought it was more to do with her believing that she couldn’t learn them, and put up a block. I felt like a useless mother as I couldn’t even teach her basic spellings, that I believed we could easily make memorable for her to learn. Her self esteem dropped and she totally believed she was stupid and this affected the whole of her education and also her social life in and out of school. I tried to boost her confidence, she is a clever child. She is good at seeing the bigger picture in life and can out argue me in a debate. She has always been very observant, not much gets past her, and her long term memory is above average. At the same time she struggles with her working memory, as she sometimes struggles with a list of instructions she has to follow. Primary school picked up on a few issues and put her on School Action Plus (SA+) at the beginning of Year 1. This means that she received an Individual Education Plan (IEP), this is a sheet of paper with individual targets ie. who will practice rhyming words with her, and things to practice at home. The IEP should be reviewed termly with parents. At around this time I started college to train as a Teaching Assistant. I volunteered at Josie’s school for a couple of mornings a week. I really enjoyed helping the children and spotting which ones needed extra support. But as I battled with Josie at home I felt so useless. How can I be any use to someone else’s child if I can’t help my own. This totally knocked my confidence in myself and actually put me off approaching the school for advice about Josie as I felt like I was a failure as a parent. And ultimately stopped me fulfilling me dream to be a Teaching Assistant. By Year 3 the school called in the local Speech and Language Therapist (SaLT). The tests showed up areas of weakness and made suggestions of various things for the school to practice with her. In Year 5 I had a meeting with the Special Educational Needs Coordinator (SENCo) at the school. They said that they would be taking away the support that she receives in class, so she learns to become independent ready for secondary school. I asked if she could be dyslexic, as she is still reversing b,d,p,q and various numbers. I was told that she is being given all the help she needs, and that she is being taught the right way for her. I am a Mum with stories about Dyslexia, the Education System and life in general.